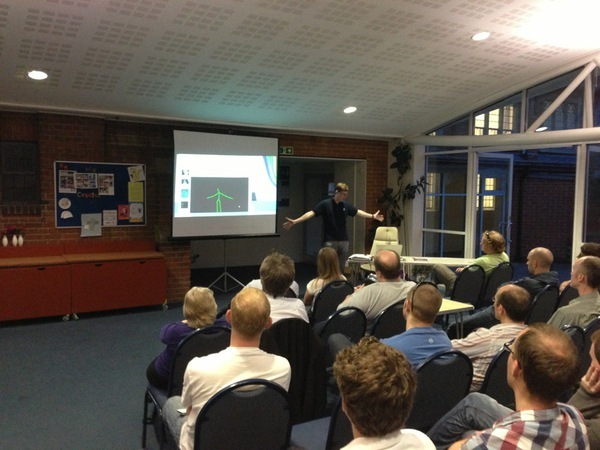 “Beginners Guide to the Kinect API”, a session aimed at scratching the surface of the Microsoft Kinect API, got its first outing last night at Dev South Coast, a monthly developers meetup in Southampton (previously known as NxtGen Southampton). The session went through the various streams of data available from the Kinect – such as audio, camera, infrared, depth, skeletal face mapping and skeletal structure mapping. Each stream had a demo and a dive into the code used. Unfortunately the audio demo decided it didn’t want to listen, however we were able to move on and take a look at the camera feeds which thankfully did work correctly. One nugget of information I wanted to get over to the attendees was that the Kinect API makes it easy to grab the post-processed data from the Kinect. The streams are really easy to pick up and the API delivers the data through events which you can easily handle. Streams such as the ColorStream() deliver camera images, add in the event of .ColorFrameReady and it’s so easy to pick up the camera frame through the event arguments (e.ColorFrame) – I don’t think it could be easier! I’ve put the session forward for DDD North and hopefully it will be picked by the attendees as it was a session I really enjoyed. Giving a talk at an event such as DDD North is a little less nerve-wracking that last nights’ talk as at a DDD event the attendees have the ability to move into a different session if they don’t connect with the topic or the spreaker. At a Dev South Coast event there is no other session, it’s like having a captive audience. Last nights session was also the first one where I’ve broken into doing live code demos – thank goodness for Coderush and templates! Hopefully the session was enjoyable – just waiting for the Dev South Coast feedback. In June 2011 I presented two sessions at DDD South West. The first was the normal Rewriting software presentation but the second was a chance to attempt something new. At DDD Scotland I had spoken to Guy Smith-Ferrier about doing a 20/20 presentation on Build Radiators and I was thankful for being given the chance to do so at DDD South West. What I didn’t expect was that on the day, in the line-up for the lunchtime 20/20’s, right before my slot, was Gary Short and his 20/20 on Asymptotes and Algorithms. To say that Gary pulled off his 20/20, with as much practice as you can get on a train from London to Bristol, minus the time it took to put the slides together, in an absolutely impeccable fashion, will not surprise many. He is a speaker who it is simply a joy to watch. How was I supposed to follow him? I tried, and I didn’t do quite as well. For those of you who don’t know what a 20/20, or Pecha Kucha, presentation is then I would suggest a quick to trip to the Wikipedia. The last time I was “North of the Border” was when I was a wee boy of five years. Holidaying in Fife, close to where my grandfather was born, was the only place in Scotland I’d ever visited. So not only was I overjoyed at having my session, “Rewriting Software is the biggest mistake a software company can make”, being accepted for a second time – and therefore dispelling the idea that the first acceptance at DDD9 was a bit more than a fluke – but I was also over the moon at being given the opportunity to make the journey upto Scotland.